“The HorseWorks experience awoke me to the realization that I am so intimidated by instructions issued by an ‘authority figure’ that I will blindly follow those instructions to the letter, as if I were still the ‘good little girl’ who never challenged the expected response. “To have reacted this way at this time flew directly in the face of who I am today … an individual who explores every possible means to an end, extended to very out-of-the-box solutions. “You may not realize this, but through your dedication, motivation and focus, you have given me great inspiration. Horses have been a lifelong passion for me, but EAGALA revealed to me a purpose through which I can indulge that passion while doing work that is meaningful and purposeful. 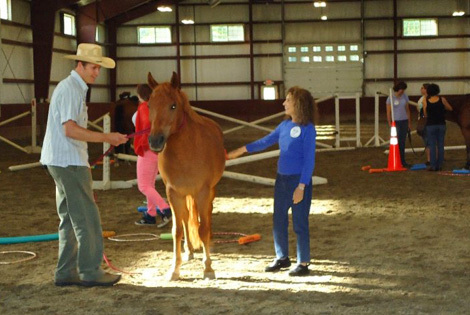 While personally I have always known that horses can bring growth through their naturally intuitive natures, in watching the interaction between your horses and groups, I have been overwhelmed by their power to transform and teach. “The experience at the end was peaceful and I felt connected to Diane in a way I haven’t felt in years. She opened up which I love and I imagine I too as part of my personality is to pay attention to another person… Transformational… I learned a great lesson about myself and my humanity. Though I felt somewhat at ease around the horses, their reaction to me made me realize was what I felt was not in harmony with the what was being projected. My vibration was not in alignment. Given the Universal Law of Vibrations, if my vibration is not in alignment, I will attract like-minded not in alignment people. This was a huge get for me. “Having no prior knowledge about the process or what to expect, the experience highlighted that it’s okay to have anxiety but not to suffer because of it. Grooming the horse sent my anxiety soaring…but as I brushed him, it started to dissipate. I realized that I can control my anxiety if I am willing to let go and just be in the moment. “I found the process to be gentle, yet challenging. Anyone looking for answers but afraid to dig deep have no choice but to see where there may be something blocking from being totally open and aware. We have gained a lot of insight since participating in the program. It is all a work in progress and some days we do better than others but at least we all seem to realize when we could be doing better. We all hate to see the program come to an end and if not for that pesky money issue would sign on for more time.